I realised for the umpteenth time that life is like a Subway sandwich (the one in which you put all the veggies and the sauces). No matter how meticulously you try to eat the thing, without the sauces or the vegetables being dropped on the tray, all you meet is heartbreak. A drop of sauce will fall down, break its crown and a slice of lettuce will come tumbling after. So what? You will still gobble up the entire thing, burp and feel happy in the end. Right. In the end, we do things that make us happy. I am also writing after many many days. That makes me happy. 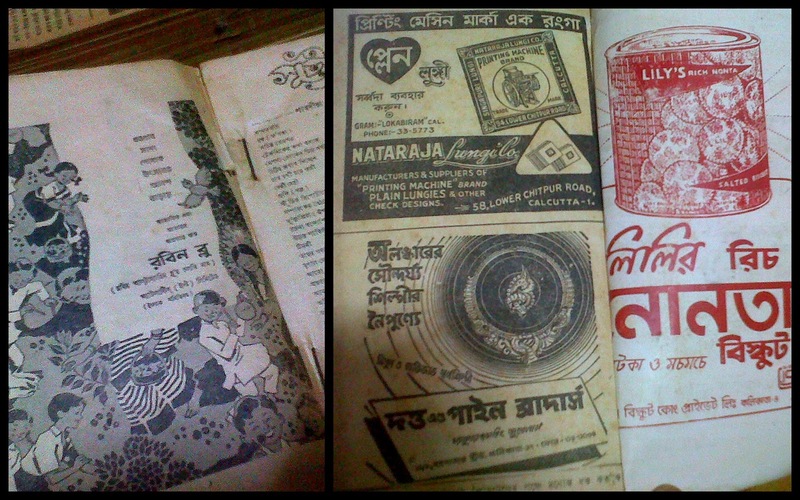 In the midst of the smoke and soot, one of the happiest things that happened was the Kolkata Book Fair. I visited boi mela with my parents. Just the three of us (I wish the sibling was here too). In addition to the Eiffel Tower of new books he would buy every year, Baba also bought used and old books and magazines. His children turned out non-exceptions. 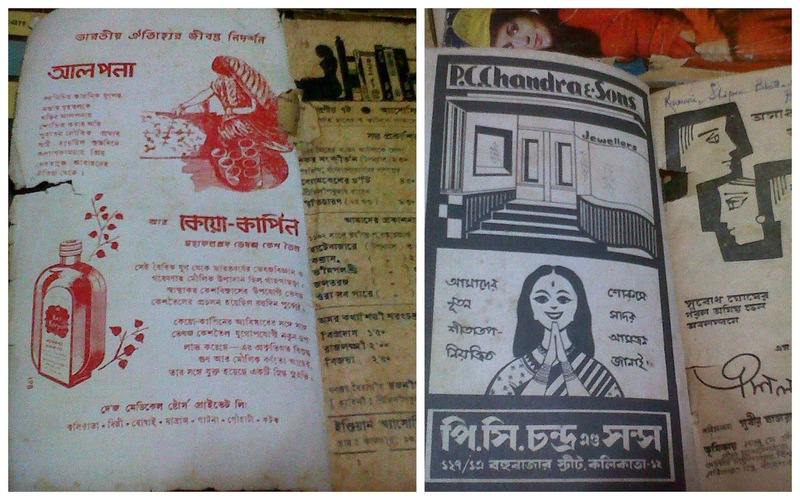 I remember my brother buying a second-hand Shakti Chattopadhyay book from College Street which was author-signed!! At the book fair, I find old magazines fascinating. Every year, I make sure I buy some. More than the articles, what amaze me are the advertisements on print. This is this year’s favourite of them of all (an advertisement by the Central Tea Board) published years back. Someone was right. In simplicity, lies the ultimate sophistication. Old books also remind me that some of the publishers have come out with reprints of the originals. The original covers, fonts, size of the book are all kept intact and published afresh. ‘Pagla Dashu’, ‘Toontoonir Boi’, ‘Haw Jaw Baw Raw Law’ are some of them. Preciousness! Baba used to buy books. And buy more books. 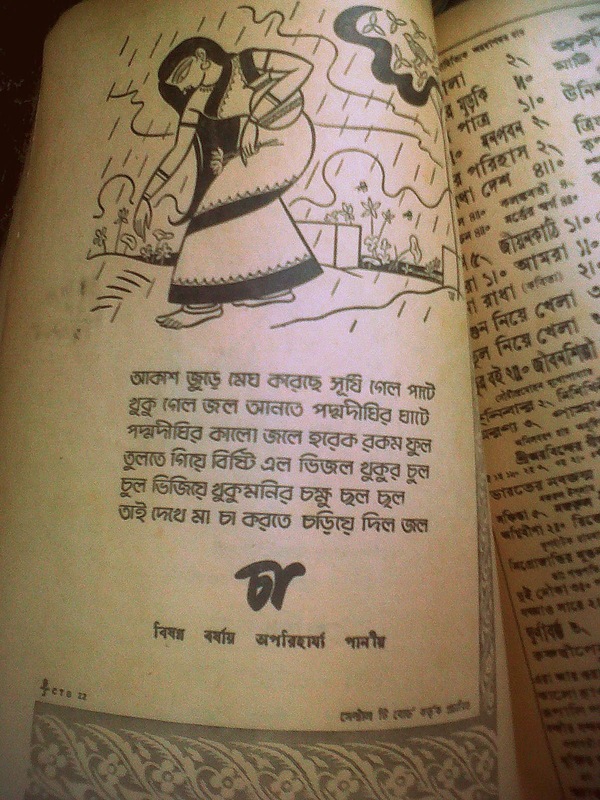 When his arms gave in, he would keep the packets in one particular (friendly) book stall and say “egulo rakhben, ami aro kine phirey shob eksathe niye jabo” (Take care of these books, till I come back). Packets would be deposited in several installments and in the end, those would be distributed among all his family members who would carry 6 to 7 packets each and come back home. This year, he was not the only one who did that. Genes! Genes! In at least 4 shops, Baba and I discovered, while billing, that we have chosen (separately, of course) the SAME books. What goose-bumps-filled coincidences they were! To add to the thrill, ALL those books were rare/unusual books. I was about to keep them away, when Baba pointed out, “Don’t. Keep one for your house as well”. So we bought one copy each. While, we secretly felt happy at the concurrence of our choices, I think we both gobbled up the lumps in the throat at the thought that we live in two different houses. But then, Book Fair always has happy things in store that dilute all lumps in the throat. In one of the stalls, I found this book on Gorky. The picture instantly reminded me of Apur Shonshar. And, that drew a smile. I also feel immense joy in discovering small pockets of ‘entrepreneurship’ in the midst of these huge events. Every time there is a match at Eden Gardens, there are people who make quick money by painting Indian tricolor on the cheeks. Five for a single cheek, ten for two. 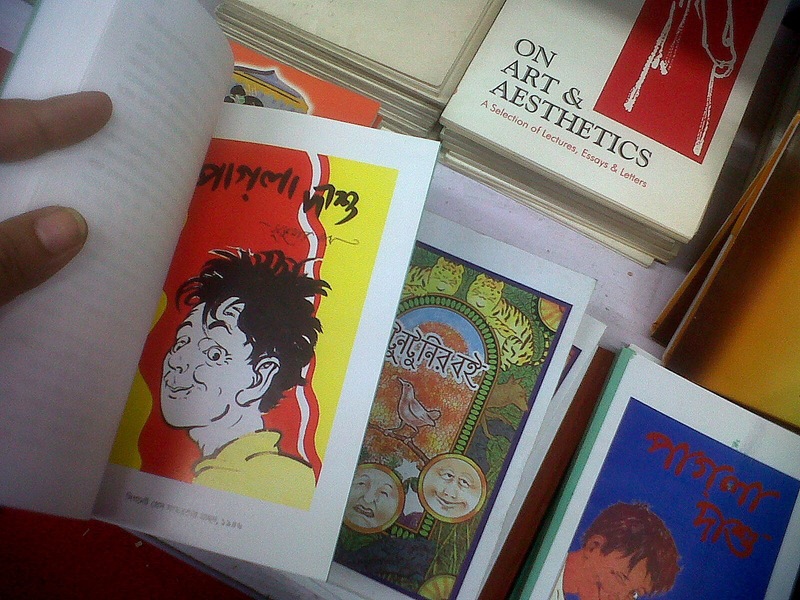 One such at the Book Fair is covering the newly bought books with cellophane (read molat). People dump their bags full of books and these gentlemen constantly put jackets around them. (picture on bottom left). 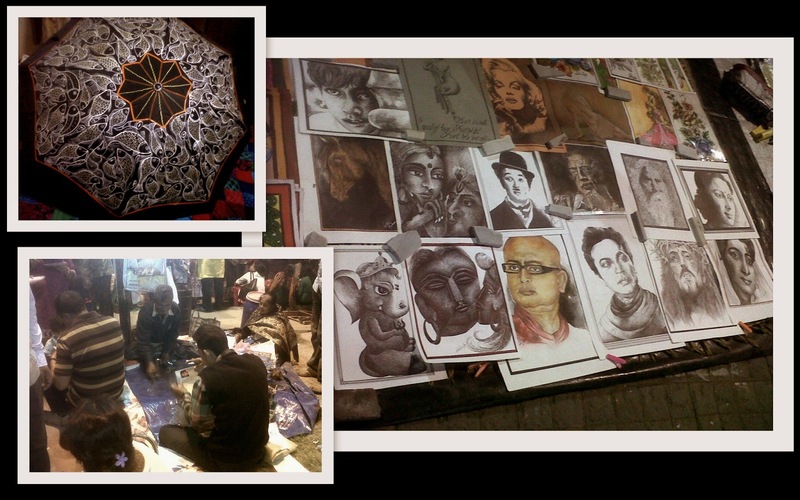 The huge display of art on the ground also makes a very happy sight. The dominance of Rituporno Ghosh and Suchitra Sen over Ma Durga, Rabi Thakur and Uttam Kumar in terms of portraits was this year’s highlight. I make it a point that alongside books, I buy at least one piece of art from the fair. The umbrella (picture on top left) was this year’s loot. Hand-painted patachitra on ‘K.C. Paul-er chhata’. Good things come to an end. So does the Book Fair. 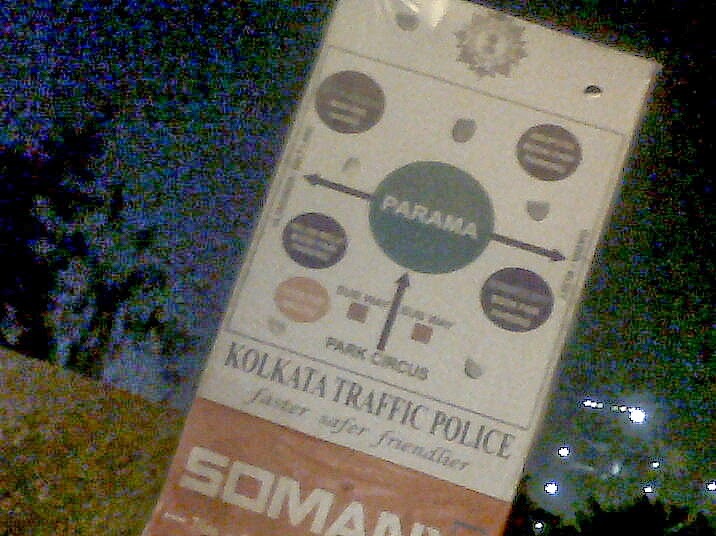 What remains is the Kolkata Police placard which guides you with right ‘directions’….towards the book fair. Awweee Parama...waited for so long..feeling refreshed now.Please porer post ta ato deri korish na.U know I make my office colleagues read your posts.They also love it. Keep writing. felt awesome reading your post after such a long time! tomar style ya eto simple r warm na, it justs melts my heart each time! Thank you so much Apala. Moudidi mane, Mousumi? O amar school er bondhu. Tomar attiyo? Thanks re. Even I had pop up books for fairy tails. 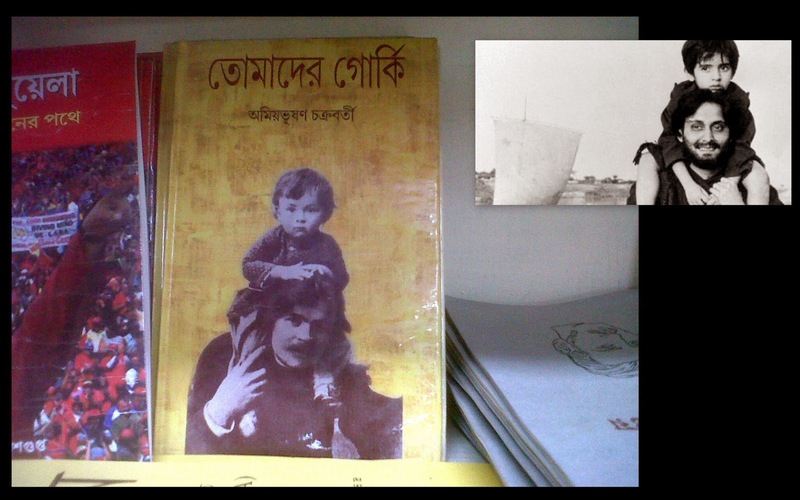 I still have...neatly treasured at baper Bari. Thank you Sumana. Nishchoi aro likhbo. Aah..! 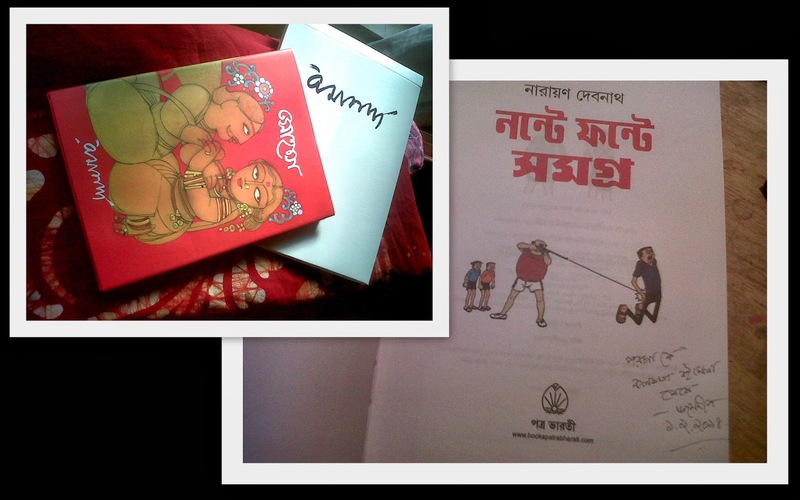 A much awaited reader's delight..! Thank you Bans. <3 I love you. very nice read, Paro :-) as always, I enjoyed it thoroughly....the wait was worth it!! Thank you Dipto! Bear hugs. WOW!!! That's wonderful. Do you have a better copy of this? The one I have is almost-luchi-bhajar moto obostha. I can't tell you how excited I am to know this. Awesome. Your grandfather's work of art is mind blowing to say the least. Thank you Sohini for such warm words. Much love. Hi Parama, I don't know you. I just found ur blog. I liked it a lot. I like ur writing style, nothing special but touches me.